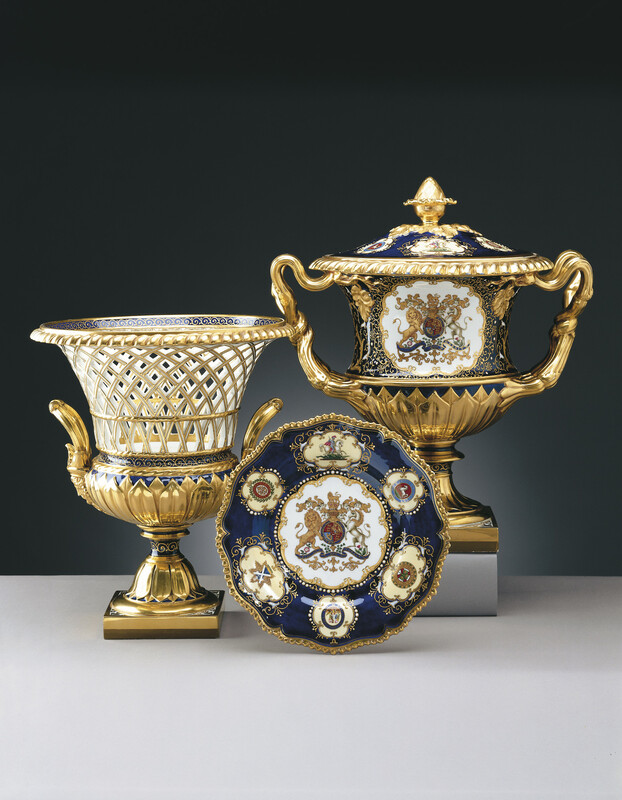 It was the successor of the original Flight firm at Worcester - now under the ownership of Joseph Flight and the brothers Martin and George Barr - that received the order for this grand dessert service, commissioned at the time of William IV's coronation in 1831. The service was delivered in 1833. The pieces are decorated with a very rich underglaze blue ground, with six reserves painted with the insignia of the Orders of the Garter, Thistle, St Patrick, Bath, St Michael and St George; and of the Guelphic Order, surrounding the royal arms, the work of the painter John Bly. The shapes employed owed much to those of classical antiquity. The ice pail is closely based on the Warwick Vase, discovered in Rome in 1770 (Glasgow, Burrell Collection). The raised gilding and 'jewelled' decoration were no doubt inspired by Vincennes and S?vres porcelain, although the techniques were quite different. At the French factories, gilding was built up in successive layers to achieve a degree of relief, whereas in this case a single layer of gold was applied over raised slip decoration. The jewelling was the work of Ishmael Sherwin. Among English manufacturers, the Barr brothers alone seem to have followed S?vres in restricting the employment of women to the burnishing of gold. Pieces from this service are regularly used to ornament the table for the annual luncheon of the Knights and Ladies of the Garter at Windsor. Now comprising 75 dessert plates, 4 ice pails, covers and liners, 4 tureens, 5 dessert stands, 4 dessert dishes, 3 comports, 5 rectangular dessert dishes, 4 oval dessert dishes.